Mostar is situated in the south of Bosnia and Herzegovina, more specifically located in the center of Herzegovina. Metropolitan area can be described as a geographical hub of the northern, western and eastern Herzegovina. Through the center of the canyon spans the Neretva River and the Mostar known as the "city on the Neretva river." The name of the city signifies "bridge-keeper", as a bridge has always been at the heart of the town's identity. By the sixteenth century, Bosnia had become part of the Ottoman Empire, in a matter of decades, Mostar was transformed from a minor river crossing to a thriving imperial crossroads.The Ottomans used monumental architecture to affirm, extend and consolidate their imperial holdings. 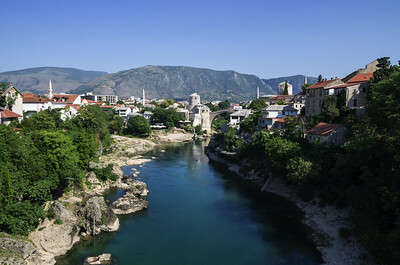 The Old Bridge is a 16th century Ottoman bridge in the city of Mostar, Bosnia and Herzegovina that crosses the river Neretva and connects two parts of the city. 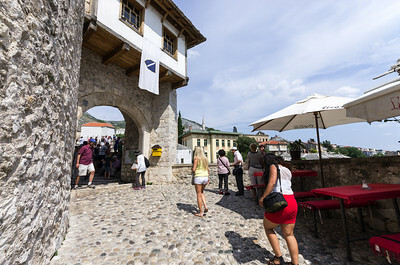 The Old Bridge stood for 427 years, but it was destroyed in 1993 during the Croat-Bosniak War.Subsequently, a project was set in motion to reconstruct it, and the rebuilt bridge opened in 2004. 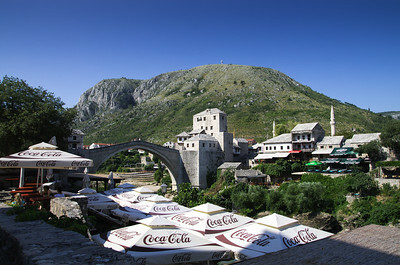 The Old Bridge is known for jumping in river Neretva and today, its symbol of Mostar and part of UNESCO world heritage. The Old Bazar is placed in the centre of the city, you can admire one of the oldest parts of Mostar, which winds along a small, pretty, cobbled street, dating back to the middle of the 16th century, where characteristic crafts shops and traditional restaurants are found. Turkish house or Biscevica corner, is one of the most beautiful preserved residential structures from the Turkish period. House is surrounded by the high walls which protected girls and women from curious men sights in 18th century. Karadozbey Mosque is a mosque in the region of Herzegovina. It was built by the Turkish architect in 16th century, but in the Second World War it was severely damaged, and in the Bosnian War it was almost completely destroyed. However, the mosque is rebuilt in 2004. and today receive big number of visitors. Old Bridge a reconstruction of a 16th-century Ottoman bridge in the city of Mostar in Bosnia and Herzegovina that crosses the river Neretva and connects two parts of the city. The Old Bridge stood for 427 years, until it was destroyed on 9 November 1993 by Croat forces during the Croat–Bosniak War. Arch is 28.7 wide and 21m high compared with summer level of the river. 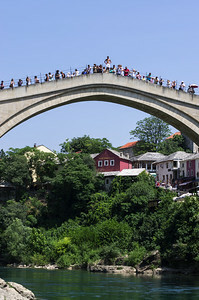 The Divers Club, a tradition of young Muslims dating back 500 years, saw an interruption after the Croato-Bosnian army destroyed the bridge in 1993. Now that the bridge has been reconstructed, these true caretakers of the Stari Most are carrying on with their tradition. 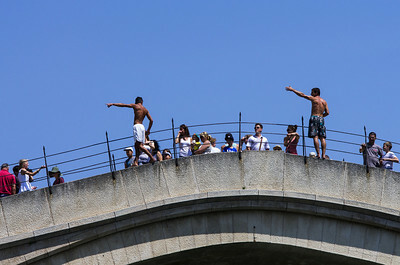 The arch of the bridge from where they dive is around 24 metres in height, deep the river is around 6 metres. Divers spoke of hitting their legs at the bottom of the river when diving in feet first. The Divers Club, a tradition of young Muslims dating back 500 years, saw an interruption after the Croato-Bosnian army destroyed the bridge in 1993. Now that the bridge has been reconstructed, these true caretakers of the Stari Most are carrying on with their tradition. The arch of the bridge from where they dive is around 24 metres in height, deep the river is around 6 metres. Divers spoke of hitting their legs at the bottom of the river when diving in feet first.